The Train No.04416 New Delhi-Haridwar Tri-Weekly Express A.C.Special Train will start from New Delhi at 07.30 a.m. on every Saturday, Sunday & Monday from 02 September 2017 to 30 October 2017 to reach Haridwar at 01.00 p.m. the same day (27 trips). In the return direction, the Train No.04415 Haridwar-NewDelhi Tri-Weekly Express A.C. Special Train will start from Haridwar at 06.45 p.m. on every Saturday, Sunday & Monday from 02 September 2017 to 30 October 2017 to reach New Delhi at 11.10 p.m. the same day (27 trips). 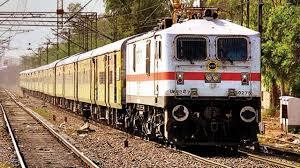 Composition and Route: These special trains will have two Executive AC Chair Car & fourteen AC Chair Car coaches, the 04416/04415 New Delhi-Haridwar-NewDelhi Tri-Weekly Express A.C.Special Train will stop at Ghaziabad, Meerut City, Merrut Cantt., Muzzafarnagar, Tapri, Roorkee & Jawalapur stations enroute in both the directions.